I just love love love Tee Too!I remembered the 1st ever item I bought from the store was a cute yellow t-shirt a few years back when they 1st opened at Asian Avenue at Sunway,with a saying that made my mama said that I am very vain when she read it.muahahaha. Now they have expanded and have 4 stores in Klang Valley,with 2 of them in Sunway Pyramid.I am a member of TeeToo(spend up to rm200 & you'll become a member there) & just keep coming back for more of their pretty vintagey looking dresses.I like the fact that they have only one dress in one particular color although they have the same design because it meant that you have less chances of your dress being worn by the same person. 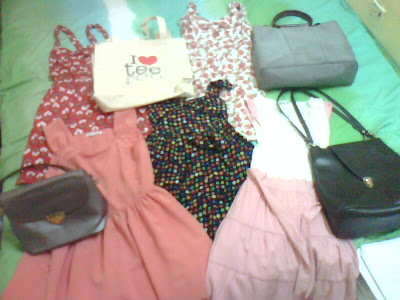 I am more of a clothes(40+ dresses & counting)and accessories person.I can wear one bag till it's in tatters and the same goes for shoes(but I do have a lot of shoes too..ahahaha).Below are some of my recent TeeToo purchases & I love all of them(oh,the 2 bags on the right aren't recent purchases but I wear them a lot).Especially the black dress with pretty colorful hoops on them--they remind me of fruit loops & I always feel so cheery when I wear it.